The European Banking Authority is pressuring the Eurozone banks and their regulators to provide a clearer disclosure on their mutual regulatory capital adequacy arrangements. The European Commission and the Italian banking system are creeping towards debt mutualisation by stealth. Germany is using the threat of the upcoming Constitutional Court hearings on QE to head off the drift towards debt mutualisation by stealth. Mario Draghi has raised the expectations for the March ECB meeting. The political process in the Eurozone continues to degenerate into populism. The last report suggested that the Eurozone banking sector had replaced the Euro currency as the key risk indicator. 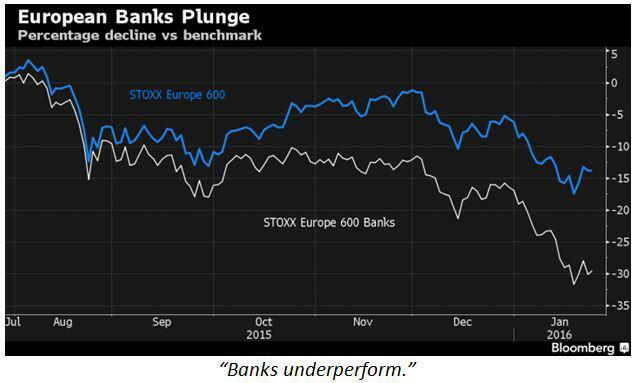 The rout in bank stocks over the last six months has wiped 400 billion Euros off their market capitalizations. Bank stocks are now trading back at levels at which rescue packages were called for back in 2012. Despite all this, the Euro maintains its strength relative to the performance of the banking sector. The currency is showing that it has the potential to survive the Eurozone banking crisis, even in the face of Mario Draghi doing his level best to undermine it with unconventional policy "instruments". The view that the banking sector is the new key risk indicator also appears to be held by the European Banking Authority (EBA). Adam Farkas, the EBA's executive director, recently turned up the heat with Eurozone banks and their regulators by asking them to clearly disclose when they have taken measures that will inhibit the banks' ability to make shareholder dividend distributions and pay contingent convertible bond coupons. Currently, the banks are not obliged to disclose any such regulatory influence on their capital adequacy. The inference is that the EBA sees some liquidity event, in the very near future, that the banks may seek to hide from the investors in these specific sectors of their capital structure. Farkas's concern over a conspiracy, between the banks and their regulators, was highlighted in the latest sleight of hand in relation to the Italian banking crisis. The European Commission (EC) lately engineered a technical opinion, which rules that state aid for the Italian banks is technically not state aid because the state guarantee will be struck at market prices. Basically, since the state will intervene at the point at which the banks become technically insolvent, there is technically no state aid, even though the state assumes all the liabilities at this point. This provision is concurrent with Jean-Claude Juncker's vision that bank deposit insurance will be mutualised at the European level along with sovereign debt. 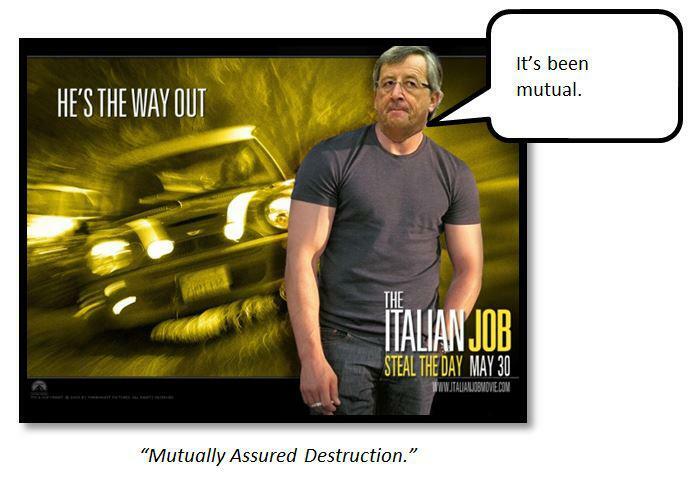 The "Italian Job" in relation to state bank guarantees is in effect an implicit step towards mutualisation. The German reaction was swift and antipathetic towards the "Italian Job". Italian Prime Minister Renzi transformed the country's position on its banking crisis into a sovereign debt crisis issue. By so doing, he opened up a can of worms, inside of which Jean-Claude Juncker could be seen squirming with embarrassment. 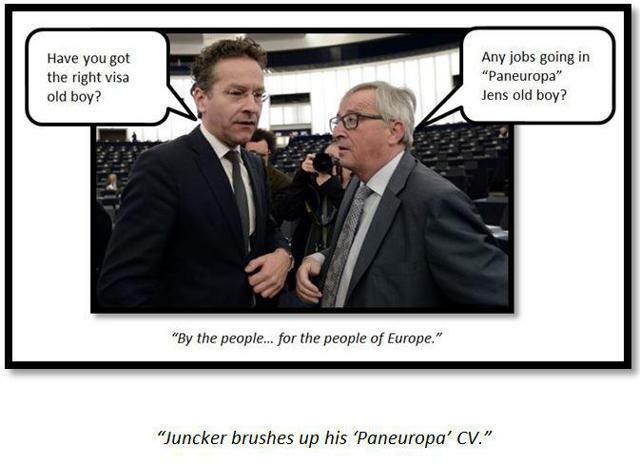 Juncker has been recently noticed booking his seat at the "Paneuropa" Last Supper event for the Eurozone. He hopes to enjoy life in the hereafter of a new Eurozone run more closely along the German lines of thinking. Matteo Renzi reminded Juncker that his position in the here and now is predicated upon his ability to mutualise bank deposit insurance and sovereign debt across the Eurozone. In a joint press conference with Angela Merkel, Renzi opined that "we are asking that the rules are applied without any misunderstandings over the fact that for us, flexibility was a necessary part of the accord that led to the election of Jean Claude Juncker," and also that "I have not changed my mind on flexibility, I hope that Jean Claude Juncker has not changed his mind." Juncker has been reminded that his political survival is tied to the issues of flexibility and mutualisation. This is a signal of the deal-breaker that finally splits the Eurozone. Germany sees combined flexibility and mutualisation as essentially sanctioning the monetization of state deficits in one nation by another. This move conflicts directly with the Stability Pact rules that Germany wishes all Eurozone nations to adhere to. Alessandro Rivera, the head of the Italian Treasury's Banking, Finance and Legal Affairs unit, kicked off the telephone roadshow to try and miraculously place non-performing Italian bank loans "wrapped" in a state guarantee. Apparently, the state guarantee will be ready for March, so the launch can be expected shortly thereafter. 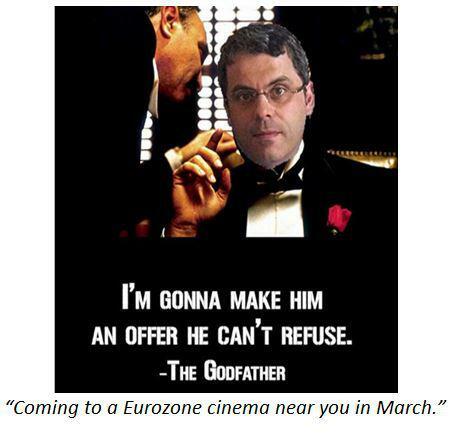 Immediately on hearing the EC ruling on the "Italian Job" and the Rivera's ode to the ides of March, the German Constitutional Court flexed its muscles again in anticipation of its hearing in February of the case for and against QE. The muscle flexing came in the form of a warning of the primacy of German courts over EU courts in relation to the German overruling of an extradition of a German-based American to Italy on a European court ruling. German courts may rule QE to be unconstitutional. In addition, they may also rule that the "Italian Job", which triggers mutual assurance of deposits and sovereign debts, is unconstitutional. It is more likely that the latter would be ruled unconstitutional because it will require a change in the constitution before German taxpayers' funds can be used to pay other nations' debt obligations. The power of the German Constitutional Court should not be underestimated. In fact, it may become the real driver of German policy going forward; as it is the one thing that politicians cannot bend to their own agendas. Angela Merkel's own coalition may be split by a constitutional legal challenge over her open-door immigration policy from her Bavarian allies. It would be amazing to see Merkel impeached about her behind closed doors handling of the refugee crisis, but this is the way it is going. If the Constitutional Court can drive domestic politics, then it has the power to influence economic policy also. Sabine Lautenschlaeger, the ECB's top banking supervisor, then dealt a further blow on behalf of Germany. She opined that the excessive fragmentation in Europe's banking supervision regime effectively undermines any central authority. She is basically saying that national regulators may play their little games with Juncker's European Commission, but nobody is being fooled by this. Legitimacy at the national level creates illegitimacy at the supranational level. The EC and by implication the EU have neither authority nor legitimacy. These implications are massive. Lautenschlaeger was swiftly followed up by Jens Weidmann. Weidmann subtly threatened Mario Draghi by indirectly alluding to the upcoming German Constitutional Court QE hearings. According to him, "if the purchase volume becomes too large, the purchases will have an impact on the secondary market similar to that of direct purchases from the states that are forbidden for us". Weidmann then went on to attack the centre of gravity around which Mario Draghi hopes to expand QE further. 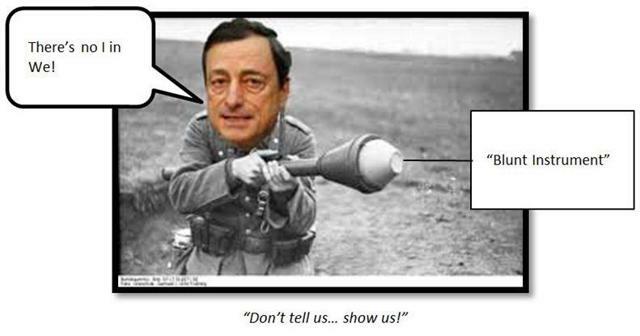 Draghi has hung his own credibility on the hook of achieving his 2% inflation target by all means available to him. Weak oil prices and the disinflation that they beget will thus be used by Draghi as the catalyst for him to expand QE. Rather than say that the 2% inflation target should be lowered or abandoned, Weidmann opined that the "short-term" nature of the dip in oil prices should be looked through. Looking through this disinflationary blip, he sees ample evidence of inflation in the Eurozone economy. He is presumably not looking any further than the German inflation data, which indeed shows an uptick despite the oil price headwind. In addition, the latest German employment data shows the unemployment rate at its lowest since reunification, a clear sign of inflationary labour market conditions. Corresponding consolidated Eurozone employment data shows unemployment at a four-year low also. 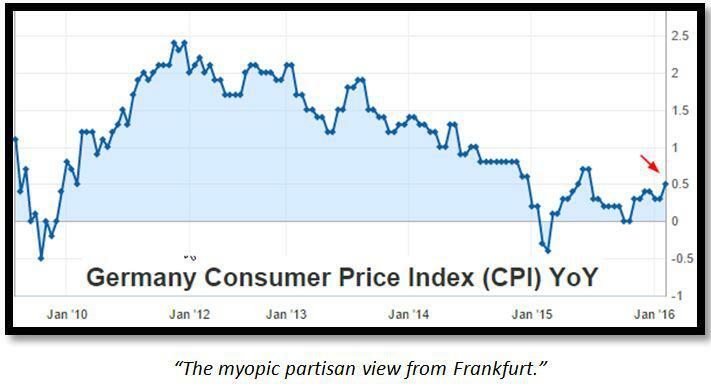 Whilst the Eurozone data in no way signals wage inflation pressures, neither does it signal deflation conditions. Draghi could claim with some justification that QE is working, but this would then make it harder to say that it needs to be expanded. What can now be expected is a semantic war, over the definition of what "short-term" low inflation is, between Weidmann and Draghi. The rhetoric will get louder as the March ECB meeting approaches. Jens Weidmann's behaviour highlights the growing trend amongst ECB Governing Council members to talk their own national central bank's book when it comes to opining in general on Eurozone matters. This trend underlies the larger systemic degenerating trend towards partisanship along national sovereign lines within ECB policy making in general. This systemic degeneration was epitomized by Ignazio Visco. Without even tactfully and professionally referring to the Eurozone, Visco immediately degenerated to the national Italian level when he recently opined the risks from global capital market volatility to the Italian economy. 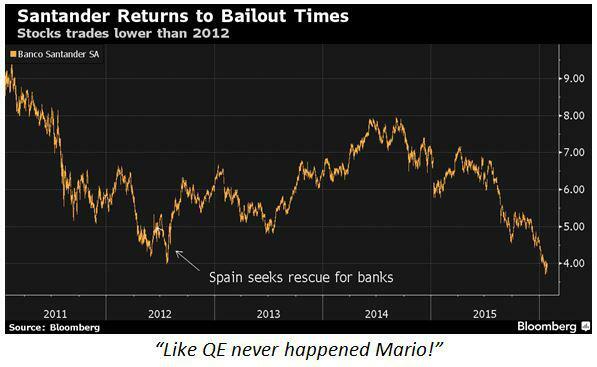 Prompted by German reaction to the "Italian Job", the European Union (EU) was forced to get involved in the current banking crisis that is morphing into a sovereign debt crisis. The EU will set up two task forces to investigate the risk rating of sovereign debt; with a view to setting potential limits on bank holdings of such debt. They are scheduled to report back in full in six months' time. Once such task force will constitute finance ministers from the Eurozone nations. The other will be a banking union task force headed by Jeroen Dijsselbloem in the Netherlands role of leading the EU administration this year. Dijsselbloem is the Dutch Finance Minister, in addition to leading the EU's rotating presidency, so he has an input into both task forces. The creation of the banking union task force clearly illustrates the thinking that this issue directly influences the prospects for a wider banking union. This banking union task force will therefore have a specific relevance to Jean-Claude Juncker's proposals for sovereign debt mutualisation and mutualisation of bank deposit insurance. The stakes are therefore high; and Dijsselbloem has deftly handled the EU bureaucracy in order to head off Juncker's plans. It should be obvious that the finance ministers' task force will try and defend their national interests by continuing the current practice of zero risk weighting on sovereign debt. The banking union task force will however address the wider context in relation the mutualisation initiative. Interestingly, the banking union task force will opine its interim findings in March, just as the Italian state guarantee on banking bad debt comes into force. This also coincides with the obligatory report by the Netherlands rotating presidency on its findings to date. Dijsselbloem has timed things to perfection in order to head off the creeping slippage towards mutualisation of sovereign debt and the expansion of this sovereign debt to the banking sector. Even though the two task forces ostensibly report back fully in six months' time, the "Italian Job" will not be able to sneak through. Meanwhile, the ECB plays both sides in order to get the best outcome for itself. Acknowledging its own German spokesperson Sabine Lautenschlaeger's opinion on fragmentation within the Eurozone, the central bank then opined that it was in favour of the harmonization of all covered bonds. The ECB has therefore been able to use a German criticism of the Eurozone against Germany in order to favour its own preference for mutualisation of all debt. The ECB just inserted the word harmonization in place of mutualisation. This is no surprise since the ECB is holding covered bonds as part of its QE portfolio. If these bonds get their credit ratings adjusted lower, following the EU task force findings, the ECB is facing capital losses that may lead to the need for a recapitalization. Harmonization and mutualisation neatly treat all covered bonds the same, so that the ECB is off the hook. The Baltic region of Northern Europe was identified in the last report as an emerging fault-line in the disintegrating Eurozone picture. Media attention has begun to focus on Finland since its finance minister's classification of the country as "the sick man of Europe". The economy has contracted every year since 2012, and was the worst performer in the Eurozone in the first three quarters of 2015. Its deficit is relatively higher than Italy's. Finland is however still ranked fourth in the European Union in terms of how much taxes and social charges it demands from its citizens whilst its unemployment rate exceeds those of its Nordic neighbours. 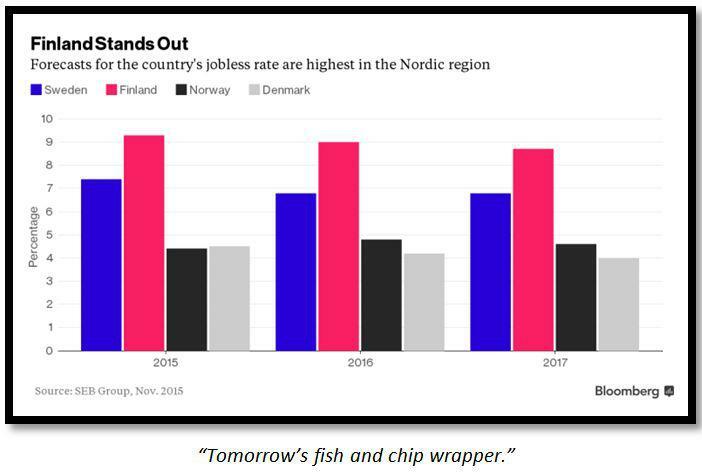 The economy and the social contract appear to be breaking in Finland. Where this has occurred in other Eurozone nations, populism and anti-EU sentiment have followed. Mario Draghi signalled his determination to adhere to his 2% inflation target. As he put it "meeting our objective is about credibility...if a central bank sets an objective, it can't just move the goalposts when it misses it." In his recent address to the European Parliament, he dramatically raised expectations for an expansion of QE. In making his case for more stimulus, he noted the "downside risks" from market volatility triggered by emerging markets, and also that "inflation dynamics are also tangibly weaker than we expected in December". Unless inflation miraculously picks up between now and March, he will deliver some further policy response. On the inflation front, Governing Council member Jan Smets lowered the bar for inflation expectations, and thus, raised the probability for an expansion of QE. Smets recently warned of a protracted period of inflation that is too low. The response may not necessarily involve an expansion of QE, as Draghi's recent "no limit" speech suggests that he has got other "instruments" in his toolbox. 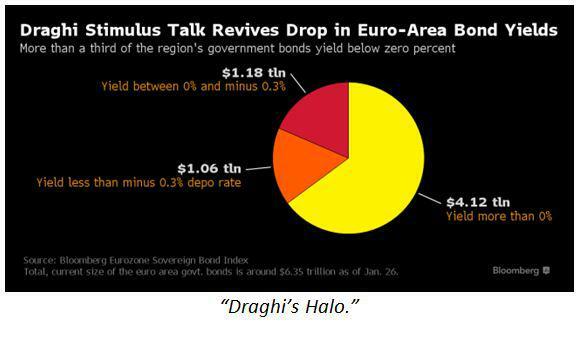 The halo effect from Draghi's words is evident in Eurozone sovereign bonds where the number of bonds ineligible for the QE programme but still with negative yields increased from $616 Billion on December 26th to more than $1 Trillion post comments. For those observers who still don't get what he is talking about, Draghi elaborated further. Using his model, QE has cut the cost of borrowing by a further 80 basis points in a Eurozone that is already at the Zero Bound. To get the same monetary impact, Draghi rationalizes that he would have had to cut interest rates by 100 basis points. Clearly, at the Zero Bound, there is no room for further interest rate cuts, but Draghi believes that he can still ease monetary conditions further with unconventional "instruments". The appearance of negative interest rates within the Eurozone is presumably an indicator that signifies this to him. Far from accepting that he has reached his limits, Draghi intends to press on. Draghi may wish to point to the fact that Euro notes in circulation grew the most on record in 2015, as evidence that his unconventional tools are working. Should he do so, he must however be reminded that the impact on inflation of all this cash sloshing around has yet to materialise. It is as if Europeans are hiding cash in the mattress because they are unwilling to deposit funds in insolvent banks that they then have to pay interest to for the privilege of having their deposits at risk. 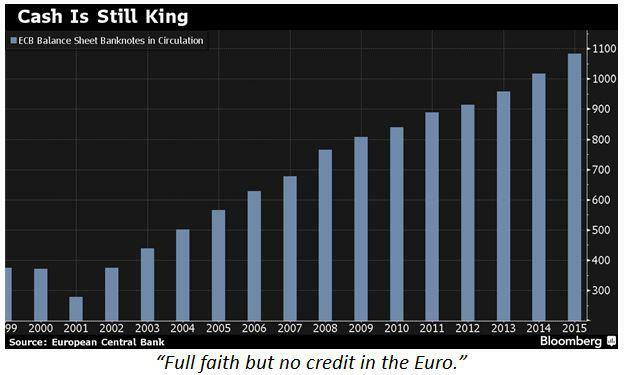 On the bright side, there is faith in the Euro to survive as a currency even if the banks and the political institutions of the Eurozone do not. In the last report, it was observed that some technocrats are preparing for a Euro currency without a Eurozone. The record number of holders of Euro notes in circulation are also confirming this outcome with their liquidity preference. The Germans have erected a Constitutional Court challenge to QE, so Draghi must now be looking for an "instrument" that behaves like QE, but is not called QE. It will be interesting to see what he comes up with and how it is misunderstood by the markets. If it transpires that this "instrument" is guidance and the promise of further easing tools, his toolbox will begin to look very empty very quickly. Cognizant of the fact that Draghi fell flat on his face, in terms of the market reaction at the December meeting, Ewald Nowotny is trying to avoid a repeat. In a recent speech, he tried his best to underwhelm market expectations for a shock and awe response in March by admonishing speculators for expecting too much from the ECB. 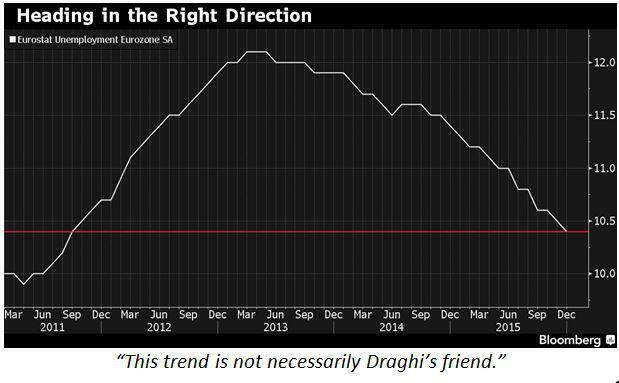 Nowotny's strategy is therefore to under-promise in order for Draghi to overwhelm. The Germans have tied one of Draghi's hands behind his back, with their resistance to QE expansion, so any progress towards it will be incremental. Despite the global headwinds, the Eurozone economic data has also started 2016 in good shape, so the risk for Draghi from continued strength must also be at the back of Nowotny's mind. Facing defeat, if the opinion polls are to be believed, Angela Merkel's party swiftly marched right to erect concentration camps on Germany's border with Austria in order to expedite the expulsion of non-qualifying immigrants. Greece has been hoping to blackmail the Euro group into providing it with better bailout terms with the spectre of masses of refugees flowing from its shores to the European hinterland. The European Union swiftly cut short this blackmail threat with its own threat to close the European border with Greece, thus forcing it to deal with its own refugee problem. Once again Greece is facing the Brexit. The consensus view amongst economists is that growth in Spain will slow if the Socialists form a government with Podemos. The Socialist prime ministerial hopeful Pedro Sanchez recently outflanked his opponents by becoming more populist. In his new populist stance, he has offered to allow the grass roots party membership to have a non-binding vote on which combination of parties it would prefer him to attempt to form a government with. Although the vote is non-binding, it will clearly have a strong influence over the configuration and composition of any new government. The manoeuvre ostensibly worked as Sanchez has now been asked by the King to try and form a government. However unpleasant this populist drift in Spain may be to Brussels, it demonstrates a genuine drift towards democracy and plurality at the national level. It remains to be seen if it can create any form of consensus on how to govern going forward. If however it is able to achieve this, the legitimacy of the democratic process at the sovereign level will be enhanced at the expense of the apparent illegitimate process in Brussels. If this populism rejects fiscal austerity, then fiscal austerity will be viewed as undemocratic and illegitimate by more people within the Eurozone. Next door in Portugal, the democratic drift is in full swing to the left. The EU signalled that it is now time to declare for the record that Portugal is heading in the opposite direction to Brussels. EU spokesperson Annika Breidthart raised the alarm when she said that there are "big differences" between the Portuguese government and the EU over its 2016 budget proposal. The Portuguese government has announced that it intends to overturn the concessions made to the EU by the previous government, so this alarm should not be a surprise. The value in the alarm signal is that it indicates the beginning of the putative "Porexit". 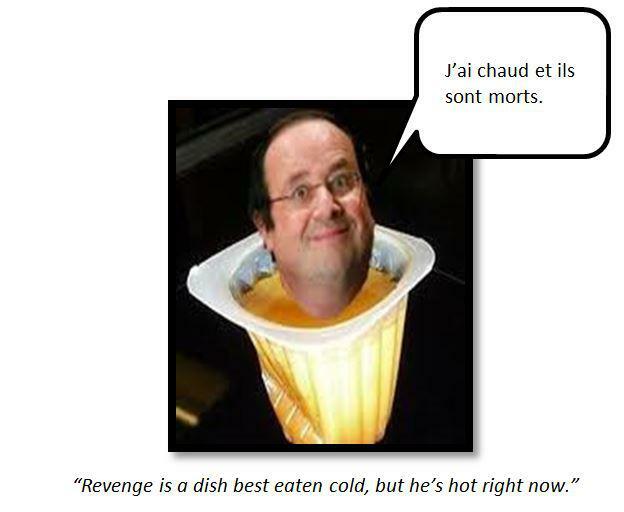 The last report observed the challengers to Francois Hollande quietly positioning themselves to attack. The latest French GDP data will have given them cause for concern, especially the favourite challenger Economy Minister Macron who demands expanded and accelerated supply-side reforms. France experienced its best growth in over two years. There were also signs that private capital investment is improving, which implies that the economic reforms are working. Hollande will no doubt clutch at these straws and poke his enemies with them. In truth, this growth must be a surprise to him, as much as anyone else, because he abandoned reform recently and embraced the Socialist principle of state subsidised intervention in his latest economic plan. National governments and their banking regulators are pursuing national self-interest at the expense of the EU. The situation has become unsustainable.